I’m sure you’re familiar with those 30 second recipe videos on Facebook. I’ve tried a few but most I wouldn’t attempt again. Remember the Apple Roses‘? Yeah…never again. Well at least not without the suggested changes. This one got my attention. So easy and although the few posts I saw suggested broiling them, I think grilling would be a better method. Time to get to work…..
Clean those mushrooms!! The goal is not to get them wet so do not even think abut running them under water. Take a basting brush or a slightly damp paper towel to brush off any excess dirt. Next, take a small spoon and gently scoop out the inner gills. Melt the butter and garlic and gently baste both sides. Return them to the baking sheet and start working on the filling. 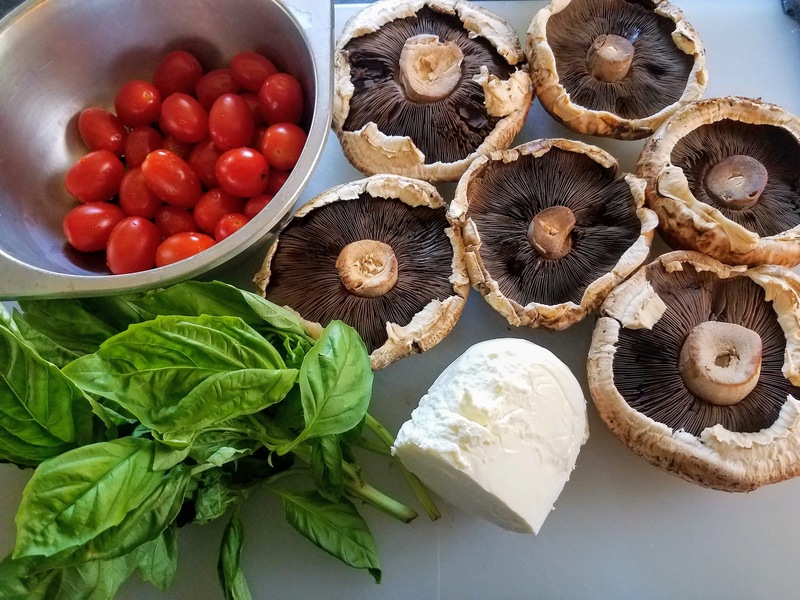 For six mushrooms, I used half a pound of fresh mozzarella, a box of grape tomatoes, a splash of olive oil, salt, pepper, red pepper flakes and a little oregano. The key is to make sure the mozzarella is diced evenly. Time to fill them up! Try to evenly distribute the cheese and tomato mixture. At this point, you can put them in the fridge until you’re ready to broil / grill. Be sure to prep some fresh basil for the finale. One final and VERY important note. When the mushrooms cook too long, they begin to release their natural juices. You will end up with a tasty yet very soggy end result. The key is to take them out of the oven as soon as you see the cheese is just about melted. If you do happen to encounter the juices from the mushrooms, simply tip them to drain and place them on a clean plate. Gently clean the mushrooms and remove the gills. Melt the butter with the garlic. Liberally brush the entire mushroom with the melted garlic butter. 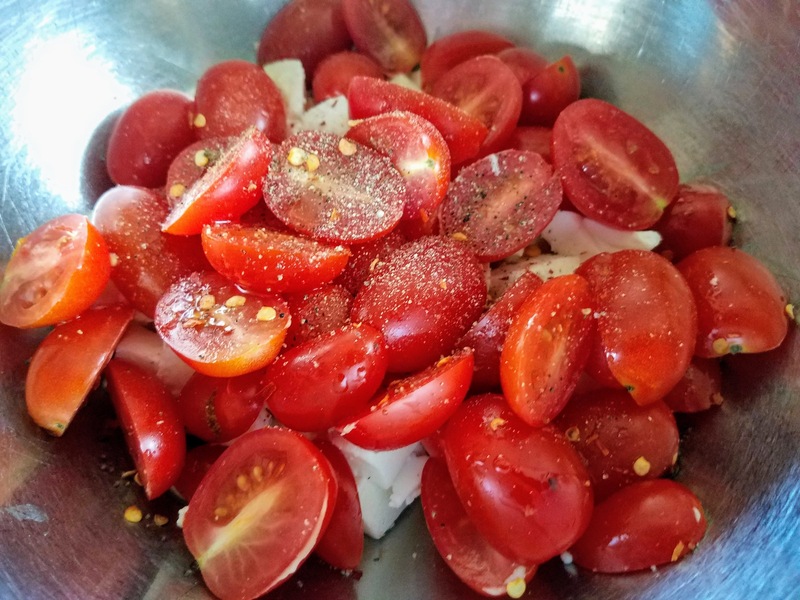 Cube the mozzarella and add the halved grape tomatoes in a bowl. Add the olive oil, oregano, red pepper flakes, salt and pepper. Toss and distribute evenly on the mushrooms. With the oven rack in the upper 2/3 position, turn the broiler on medium high. Cook no longer than 6-7 minutes, watching them very carefully. 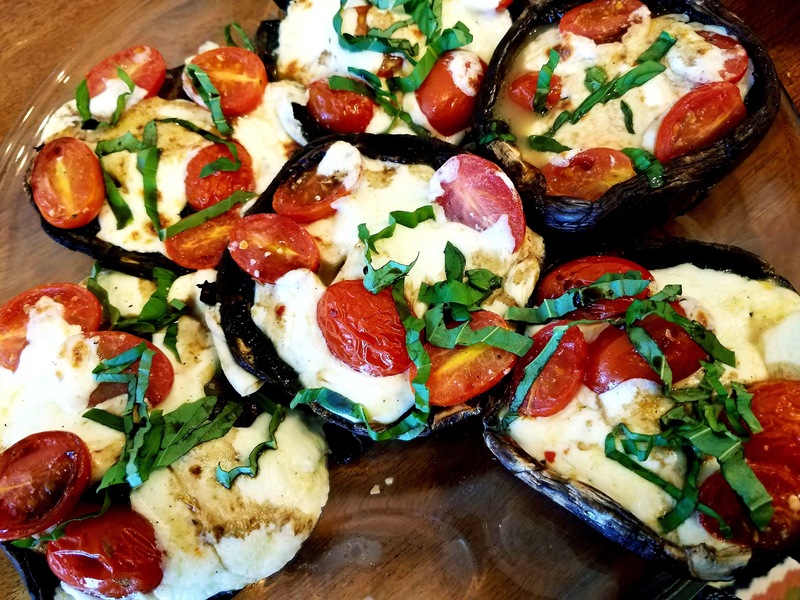 Serve immediately, with fresh basil and a drizzle of balsamic vinegar. 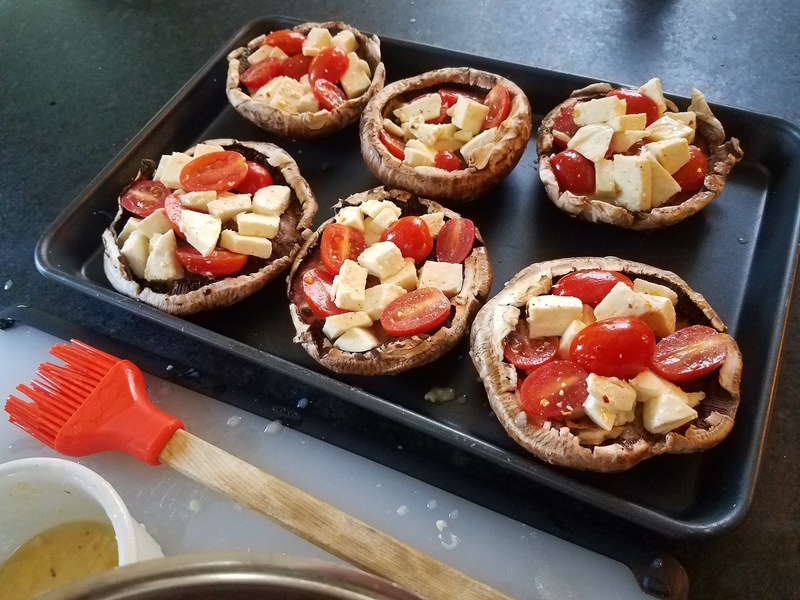 If serving as an appetizers, quarter the mushrooms while hot. Otherwise, they’d make a great main course with a salad. These look delicious! Thank you for the recipe! I was quite surprised they were such a hit and took all of 15 minutes, from start to finish.